Of late I've been slowly moving some of my posts to my other blog. The posts in question seemed misplaced in contrast to most of the content appearing here, hence the reason for the move. While doing this, I was forced to confront one major roadblock: the posts, while few, had already been indexed on Google SERP. As such, simply deleting these posts and moving them to my other blog would have little effect on their index status on the search results, at least in the next few months. A better approach, and the one that's recommended from a SEO perspective, is to do permanent 301-redirects to the new URLs in the new blog. This way, not only will my readers find the content they were looking for (instead of getting a 404) but Google Bots will also follow their new locations on my other blog, hence retaining their position in the search result pages. Unfortunately as you might have figured out by now, it's not possible to do 301 redirects on Blogger to external sites or other blogger blogs, be they on a BlogSpot domain or a Custom domain. Such redirects can only be done internally within the blog itself. So what does that mean? For me well it meant I had to swallow the bitter pill and just do the 404's. Eventually those posts would be dropped from the search results as the bots encounter their 404 response. This would however take long and in the meanwhile it would mean traffic from the search results would instead be greeted with my 404 page. To avoid this, I decided to remove the URLs from the search results using Search Console's Remove URL Tool. Google recommends the use of this tool as a temporary measure (for instance removing sensitive content); for permanent removal however, one has to ensure that the source pages are completely removed or updated. I chose to do the former and have since successfully removed some high ranking posts with it. It however took some trial and error initially due to Blogger's peculiar URL structure and how Google indexes them. I'll be addressing this so that you can avoid some of these pitfalls when using the Remove URL Tool. 1. Find which posts or pages you want to remove and copy their URLs somewhere. 2. If you want to remove the post or page completely, delete it so that it returns a 404 page. If it's just temporarily, just leave it as it is. 1. If you're not using Google's Search Console already, go to the Search Console page and Sign in into your Google Account to get started. 2. Next add your Blogger Site as a New Property. You'll then may be required to verify your ownership of this website using various methods. You won't have to verify the variations again. If you haven't turned on HTTPS in Blogger settings, you can skip adding the HTTPS versions. 4. To finish, make sure to select your preferred domain among the variations www/non-www variations you've added. If you're unsure which to use, check which Google indexes in their search results. If you want to set the HTTPS version as the preffered domain, make sure the redirect to HTTPs is turned on in blogger settings. 1. On your Search Console Dashboard select the property of your preferred domain (or the one that Google has indexed). 2. From the sidebar select Google Index then Remove URLs. 3. Before removing the URL, it’s a good idea to first check which exact URL is being used in the Google Search Results. This is because the URL as you published may not necessarily be the one or the only one that has been indexed. Now you may find that Google has indexed one of these variations or even all of them. Since there's no canonical URL among them, Google makes that choice for you. b. Open the search result and from the address bar observe the URL used. Copy this URL. 4. 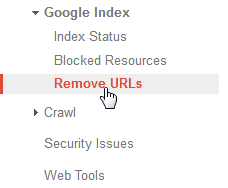 Go back to the Remove URLs page on Search Console and click on the Temporarily Hide button. 5. Paste the URL that you copied and click the Continue button. 6. On the Request Type select the first option: Temporarily hide page from search result and remove cache. If you just want to remove the cached version, select the second option: Remove page from cache only. this will also remove the non-www/www and http/https versions and so you don't have to remove those manually if they're already indexed. 7. Click the Submit Request button to finish. You should get a notification informing you that the URL has been added for removal. If that particular URL had already been removed, you'll get a notification on the same. 8. The URL will now appear in the removal queue with a Pending Status. Should you want to cancel request, do it before the Pending status changes to Removed. If you happen to enter an invalid URL as I did myself a couple of times, the status will change to Expired after a few days. So take note of the URL after it queues it for removal. 9. Now just repeat this process for the mobile and desktop URL variations if they're indexed too. If you're not sure, it won't hurt removing them as well (this is what I had ignored and for a week or two I was under the false impression that Google was "refusing" to remove some of my URLs). 10. Now just give it 24 hours or some few days and the URLs status will change to Removed. If they're returning 404s they should be gone permanently. On the other hand, if this was just a temporary measure, you can return them back to the search results by clicking the Reinclude button. A few days after after doing this for your deleted pages, you'll start getting messages on your Search Console/Email regarding new coverage issues. These issues will be the new 404s the bots are getting and search console will alert you in hope of you fixing them. Don't do this. If you mark them as fixed, you'd be telling Google that the pages still exist which is not the case and this will merely result in an endless cycle of you being prompted to fix said URLs. Just leave them as they are and over time Google will figure out the pages are not missing by mistake and therefore should be removed permanently from their index.